Just when you thought board games had hit their technological peak with Trivial Pursuit DVD Edition, a company has released a game that puts all other board games to shame. 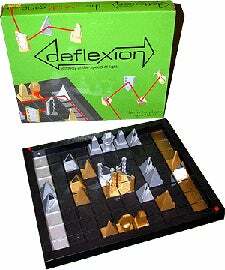 This is Deflexion, a board game that uses lasers and physics concepts for either hours of fun or a burned-out retina. The idea of the game is to build a setup using an assortment of djeds, pyramids and obelisks to bounce a laser around the board to hit and annihilate your opponent's pharaoh. Why they decided on pharaoh, who knows. Maybe the creators are anti-Egyptian. Or anti-Scooby Doo villains.